Sometimes, you should heed the meme. it seems that even Singapore's sky cried for the loss of LKY today. The sky, the country, the people weep for you today Mr Lee. Farewell and thank you. 50 years ago he cried for this nation. 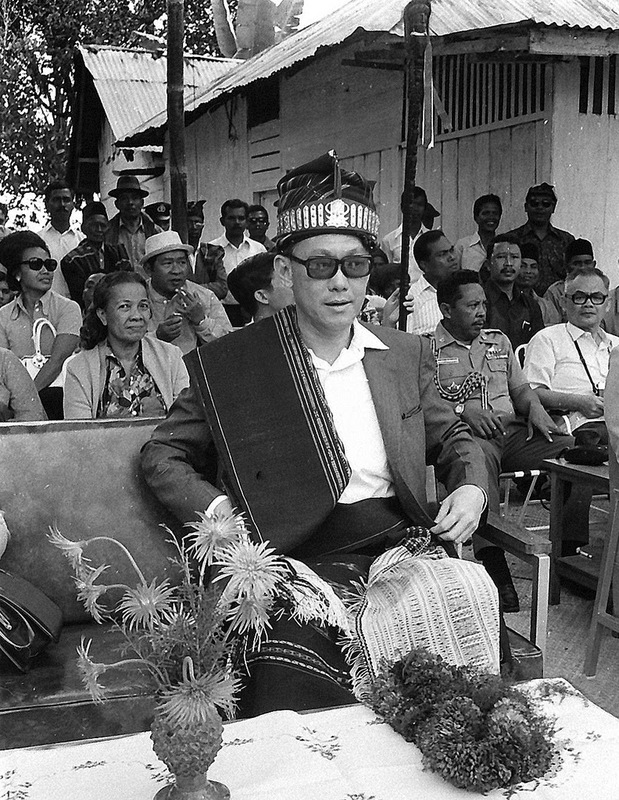 50 years later, the nation and the sky cries for him. 2 years ago, we (your friends) shed the same tears for you and the sky cried for you too. Soon you'll meet him in heaven. The sky mourns and sheds its tears as we say goodbye to Mr. Lee Kuan Yew. the sky is definitely crying for Mr Lee and all these rains represent all the Singaporean tears. Singaporeans cried for the past 5 days over the loss of our great leader.. now even the sky's crying..
And the sky finally cried on Mr Lee Kuan Yew's funeral wake. 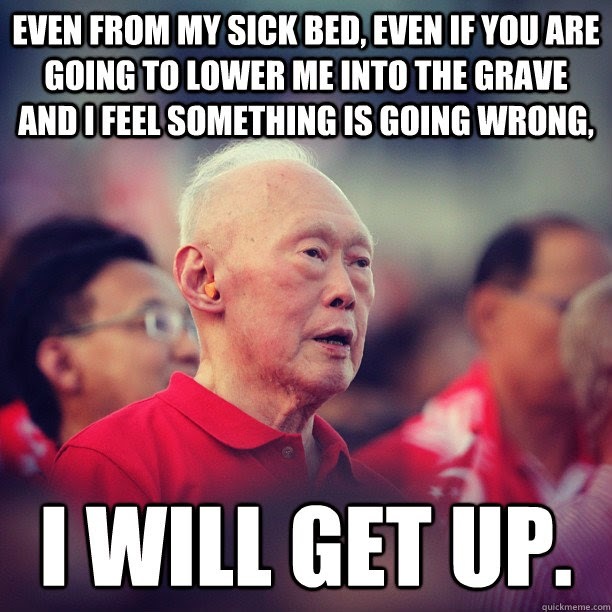 the skies cried for him when he was first appointed as sg's 1st PM. and the sky cried again for him to send him off for the last time. 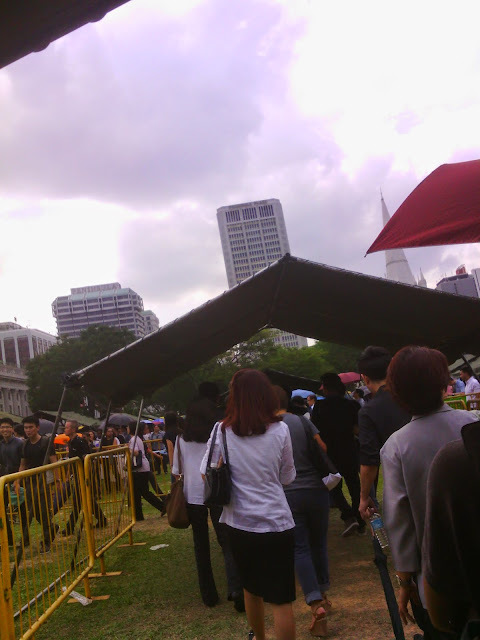 Unlike many Singaporeans it seems, I'm not a big queuer. No queueing for multiple hours for Hello Kitty or iPhones for me. Of course I knew that by the time I got to the Padang, it would probably be longer than 30 minutes, but it shouldn't be too bad. 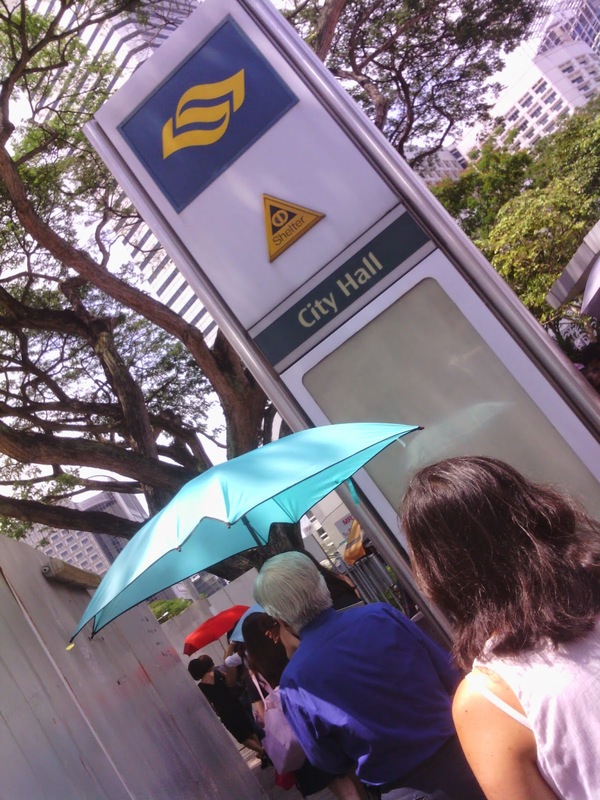 The moment my wife and I stepped out of City Hall MRT station some time past 2pm yesterday, we saw people joining a long queue outside St Andrew's Cathedral. I assume it had to be The Queue. It helped that there was a young girl holding up a sign that said "Queue starts here". It didn't help that she looked a bit frazzled and was relieved to see a bunch of navy guys in uniform behind us. She quickly went to them and asked, "Are you here to help?" The navy guys looked confused. "Help what?" one of them asked, although it was pretty obvious to me why she needed help. 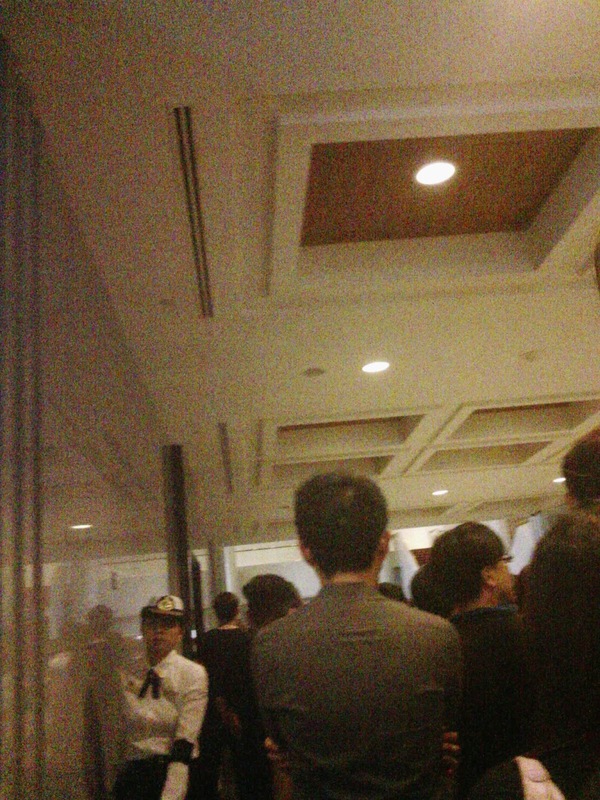 "Help manage the queue," said the girl. 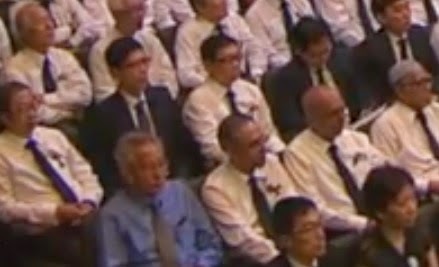 The navy guy said, "No, we're here to pay our respects to Lee Kuan Yew." Those must be the saddest words the girl had ever heard in her life. To say she was crestfallen would be an understatement. I thought the navy guys might step up and save the damsel in distress by helping the poor girl with The Queue anyway, but I guess they wouldn't know what to do themselves. The crush of people was just overwhelming. Meanwhile. as she was talking to the navy guys, people who had just arrived were wondering about the sign she was still holding up. Someone asked, "Does The Queue start here?" No, it didn't. People had already queued up behind the navy guys. The sign was a lie. After she realised the navy guys weren't the saviours she was hoping for, she left to find the real start of The Queue, I assumed. Not a very reassuring beginning to my queueing experience, but at least I was now mentally prepared for more queue mismanagement. I started the digital stopwatch on my iPhone. The Queue moved in stops and starts. This could be because we had to cross a road and wait for the light to change. 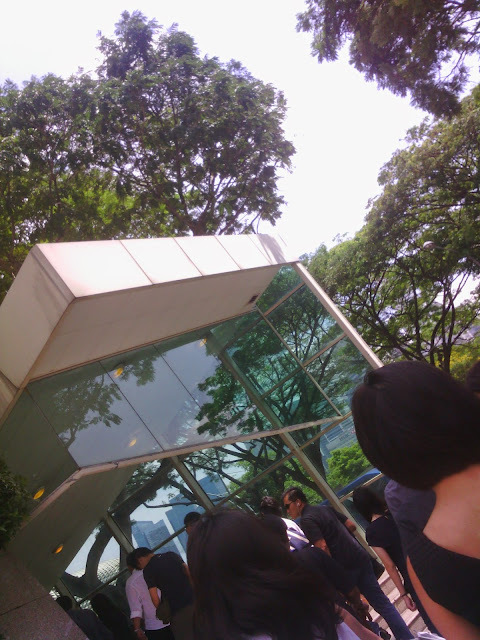 The Queue then went underground into the Esplanade MRT station and back out again. Along the way, we were offered umbrellas and bottled water by different people. At the Padang, we got cake from BreadTalk (to make up for its earlier faux pas perhaps?). We were stuck at the Padang for a long time. More than hour in, I considered quitting The Queue. 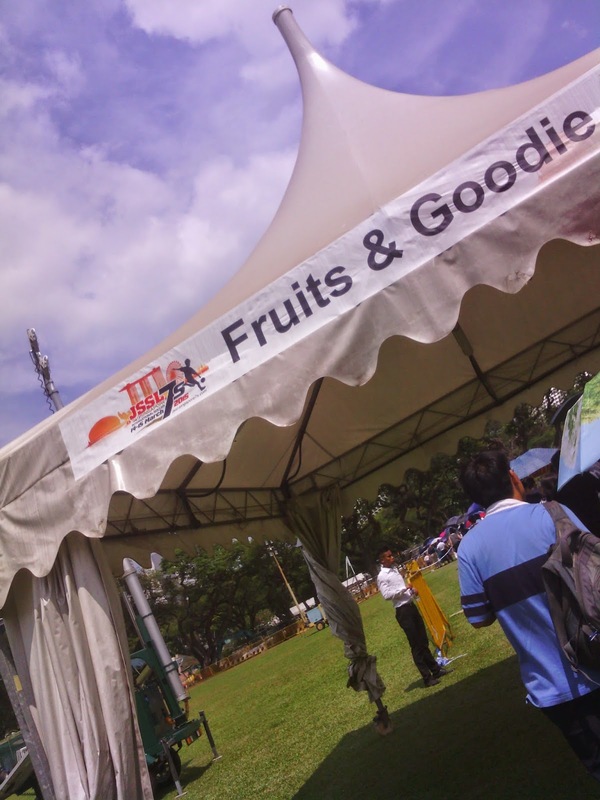 Despite the tents, the afternoon heat was getting to me. More importantly, I needed to pee very badly. There were no Porta-Pumpers at the Padang. One happy surprise was I saw an old NS friend, Patrick, there. He was on duty as an SCDF volunteer paramedic. A former naval diver, Patrick was the guy who went on a rant against Jack Neo's frogmen movie I wrote about in my column last year. He came to talk to me, but before I could say a single word, he was called away because of a casualty. I later saw him stretchering a woman to the first aid tent. It was a reminder to keep hydrated. The problem was the more you drink, the more you may need to pee. 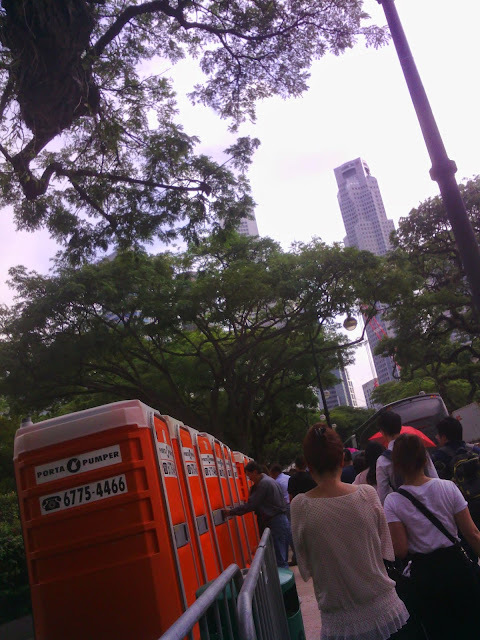 Fortunately, after we moved out of the mini tent city at the Padang, a row of Porta-Pumpers awaited. I eventually figured out how to use one. After relieving myself, I felt like I could go on for a couple more hours in The Queue. We got to the river and a boat with a picture of LKY went by. How fitting. 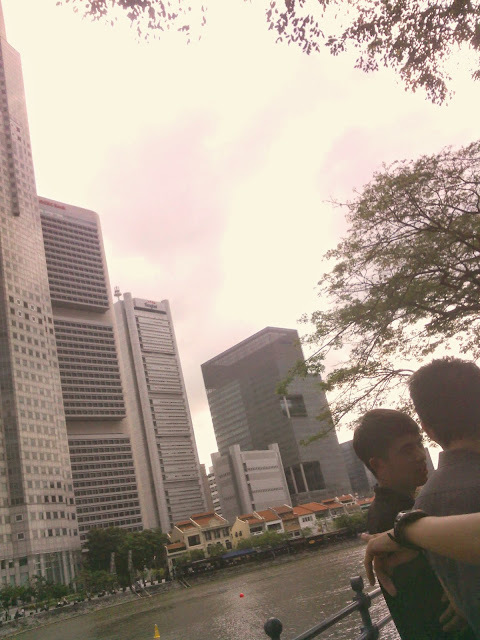 From across the river, we heard cheers from the Boat Quay bars. I believe the cheers were for the India-Australia cricket game going on at the time. India eventually lost the World Cup semi-final. 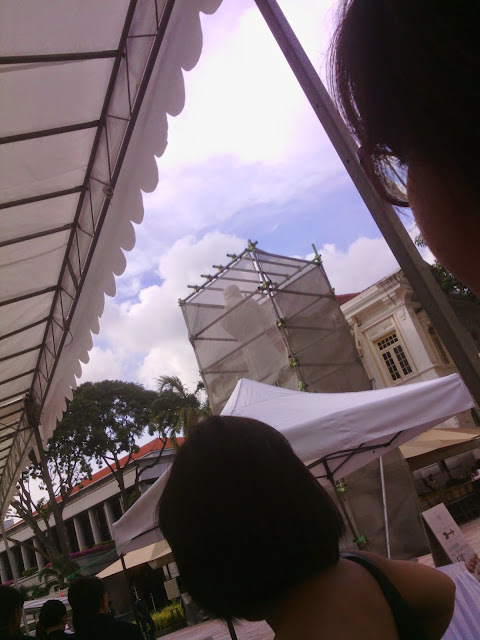 After the Asian Civilisations Museum, we reached a long white tent where a sign said: "Waiting time from this point: 30 minutes." Almost there! 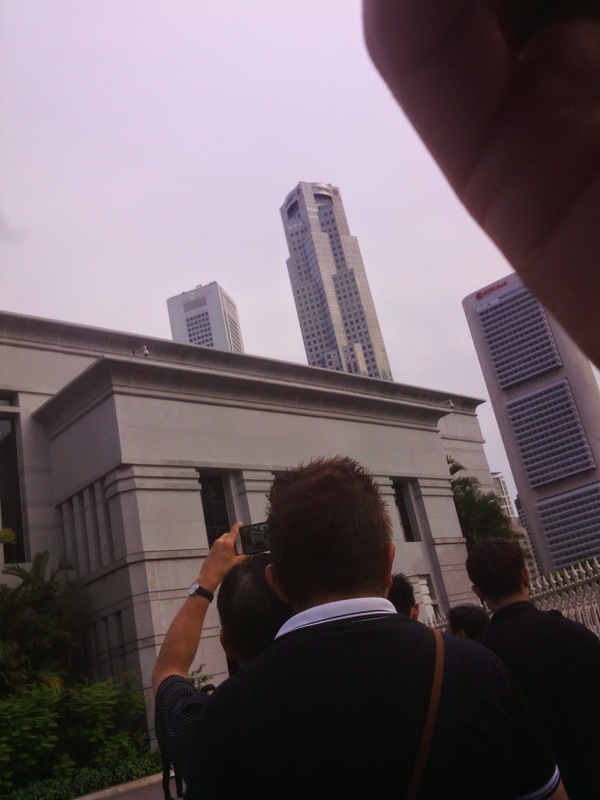 We could see the back of the statue of the other "founding father" of Singapore, Sir Stamford Raffles, under renovation. 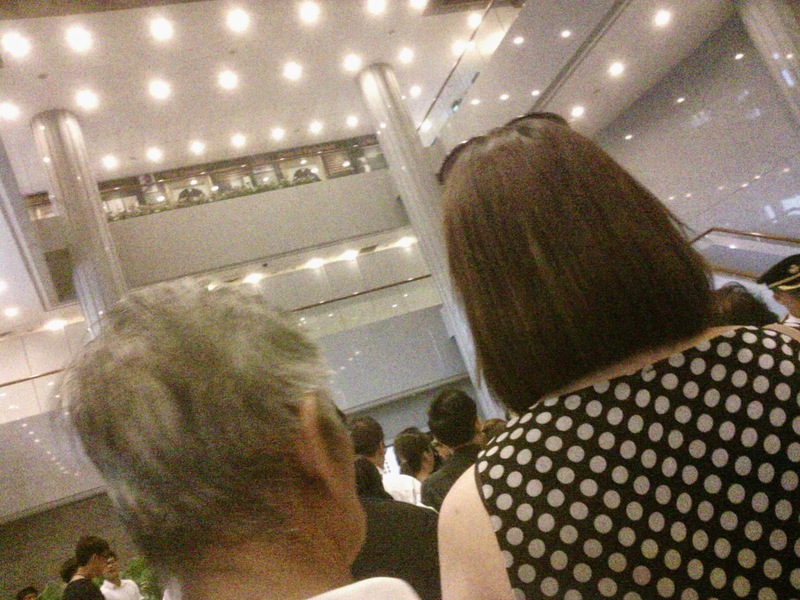 A woman in front of me who had been carrying flowers for LKY for over two hours had them unceremoniously taken away. After seeing piles of umbrellas in the tent, another woman tried to return her umbrella but was refused. There were a row of scanners on stand-by. After going through the metal detectors, we left the tent and saw Parliament House. Is that where we were supposed to go? Finally! I don't think regular folks like us would get to visit Parliament House any other time and hence all the photo-taking. Put away your cameras, we're going in! Once we stepped into the air-conditioned Parliament House, the cold was a welcome relief. We were told to keep moving and I barely got a glimpse of what I queued up three hours for because of all the people. I was almost run over by a guy in a wheelchair. And before I knew it, I was on my way out. Outside, there was a queue to get out of the area and another queue of people waiting to go in. I believe the latter was the priority queue. It seemed to me that with people in wheelchairs, the elderly and parents with small children, the priority queue moved more slowly than the regular queue. I checked my stopwatch. I had been in The Queue for more than 3 hours and 10 minutes. That was quite a lot longer than 30 minutes. 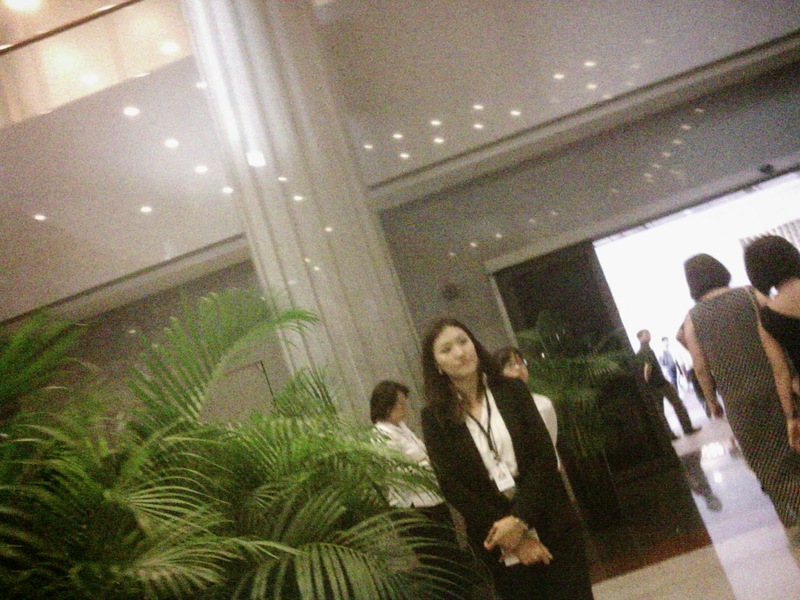 I didn't get to do much inside Parliament House with my few seconds before Mr Lee. I didn't even have time to bow and I don't believe in prayer. I actually considered saluting, but my hair was too long. If I had lingered a little longer in front of the coffin, I felt like I might've burst into tears. So maybe it was a good thing the guy in the wheelchair came along. 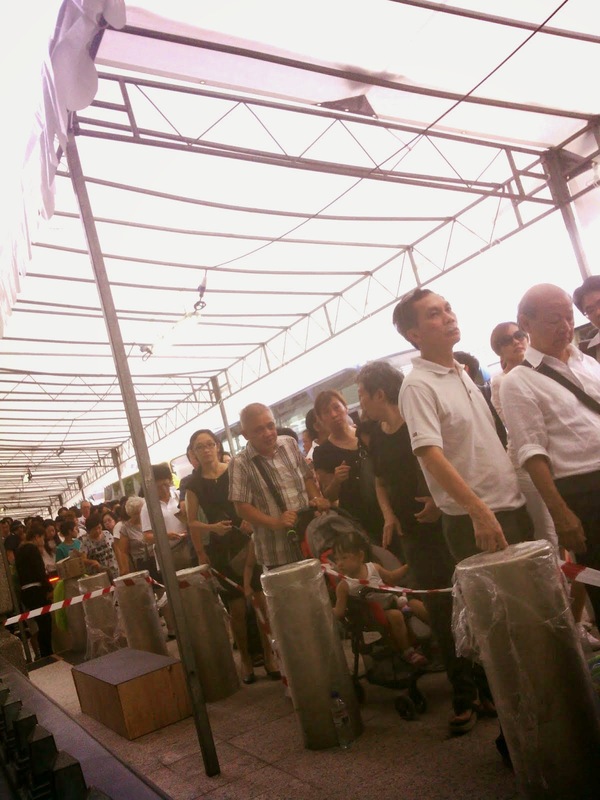 I guess in the end, my time in The Queue was my tribute to LKY. All 190 minutes of it. I hope the poor girl with the "Queue starts here" sign found someone to rescue her. 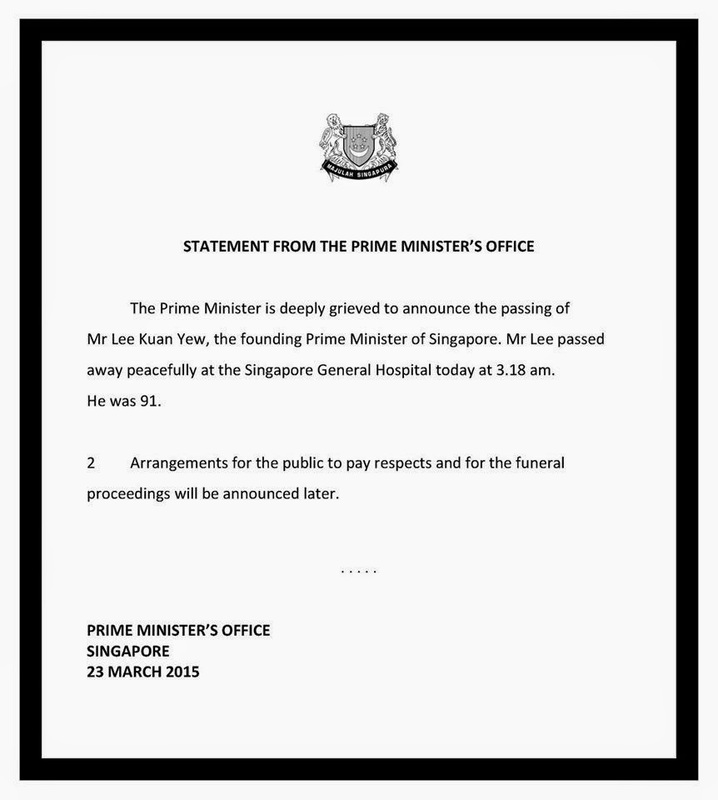 Is there a wrong way to pay tribute to Lee Kuan Yew? The run was scheduled to take place on Sunday, but that turned out to be also the day of the funeral. What should the organisers do? 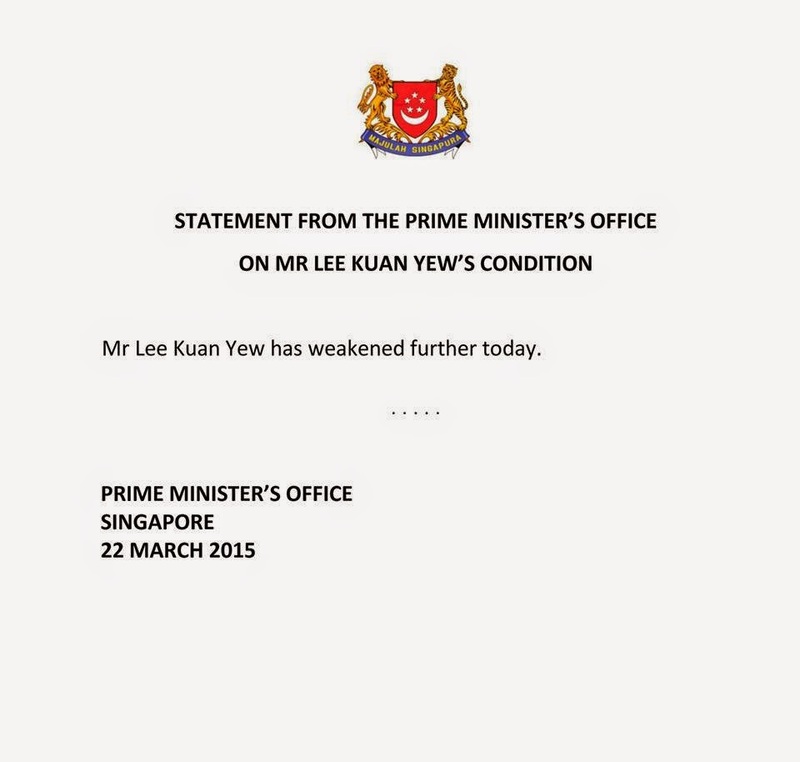 Should they call off the run out of respect for LKY? There could also be logistical issues since roads have to be closed for the run and the funeral. But what about foreign runners who had already booked accomodations and flights to Singapore for the run? I had signed up for the run too. 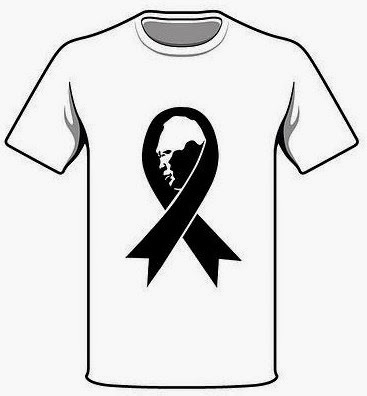 Some suggested that since the event shirt is black anyway, the run could be turned into a tribute to Mr Lee. 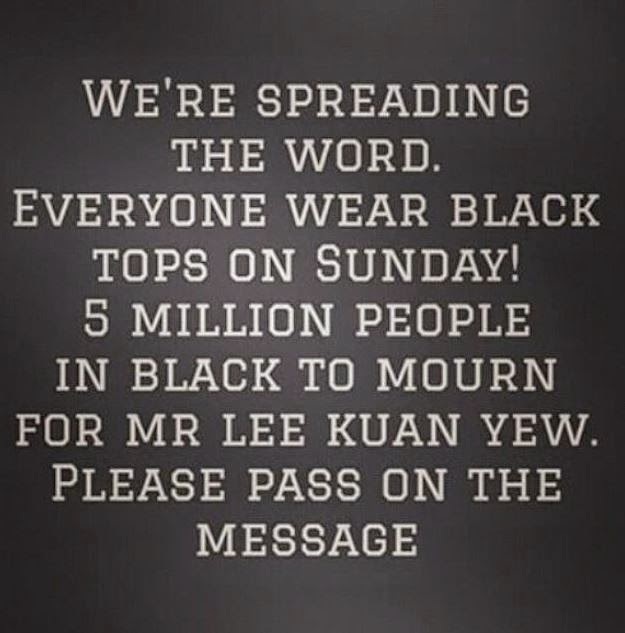 I actually thought that was a good idea, especially after the call to get 5 million people to wear black on Sunday to mourn for LKY went viral. Picture thousands of black-wearing runners going the distance in memory of Mr Lee on the morning of his funeral. The shirt colour, the timing and the symbolism couldn't be more perfect. But I figured the organisers needed to get some form of official blessing to make it a legitimate tribute, like, say, from Mr Lawrence Wong, who heads the Ministry for Culture, Community and Youth, which looks after sports. What I find odd is that if you don't wish to participate in the rescheduled run, the organisers won't give you a refund, but you'll get the 21km finisher T-shirt – despite not running a single metre. That doesn't seem right to me. 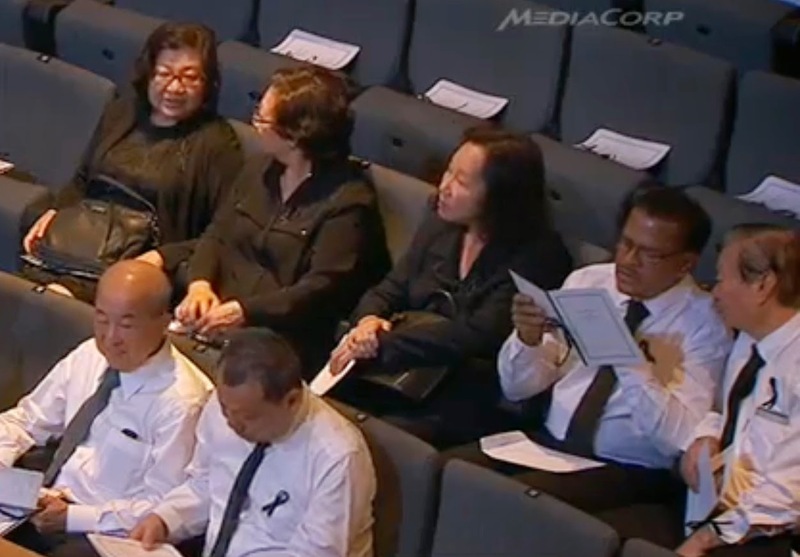 But Mr Teo Ser Luck wasn't the only one criticised for his unconventional LKY commemmoration. 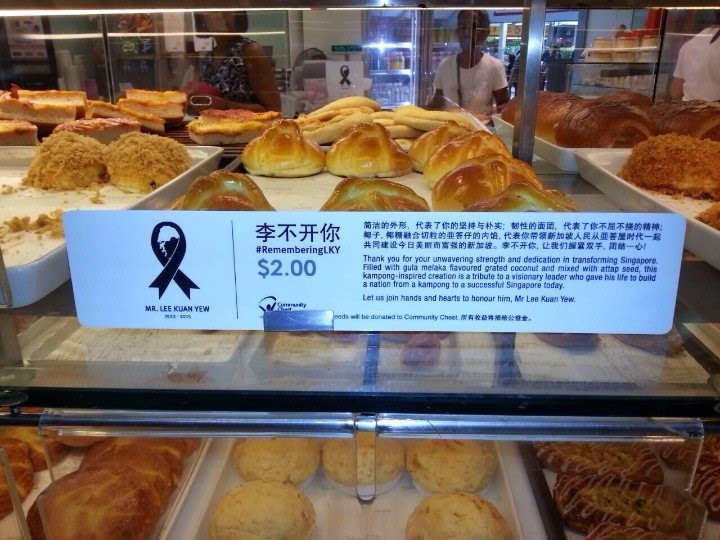 BreakTalk ended up apologising for its #RememberingLKY "commemorative" bun. 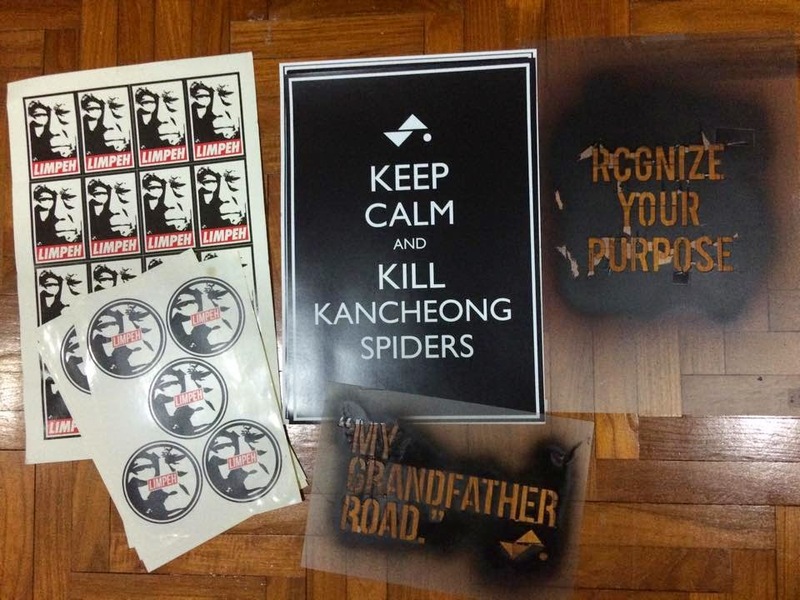 At what point does an LKY tribute become inappropriate or, worse, exploitative? Wait, since when can you dedicate your birthday to someone else? 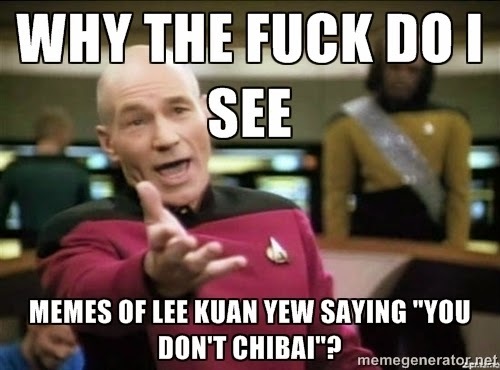 I know Phua Chu Kang means well, but really? 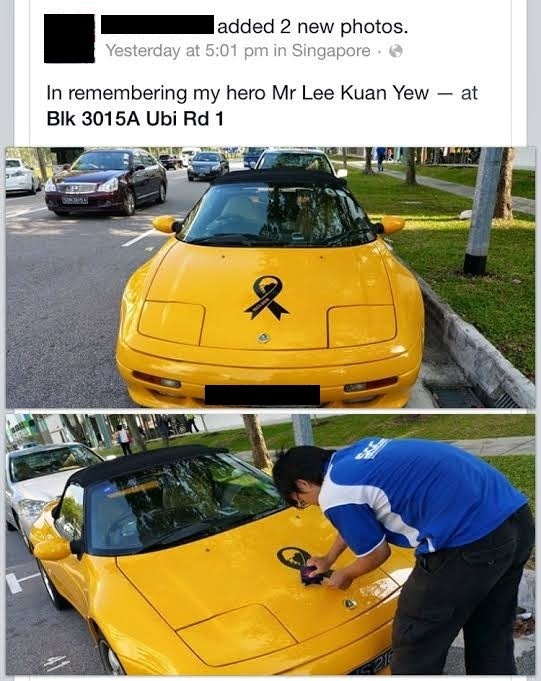 And one guy turned his hot car into an LKY tribute on wheels. I think it's a Lotus. 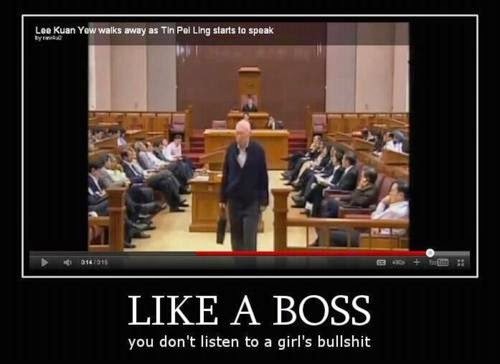 Now that's a fast and furiously big fan of LKY. 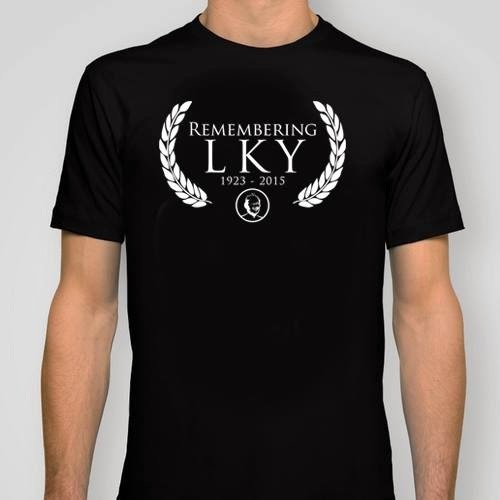 And then there are the LKY T-shirts for sale online. Like the 2XU Compression Run finisher tee, you don't have to run a half marathon to get these shirts. 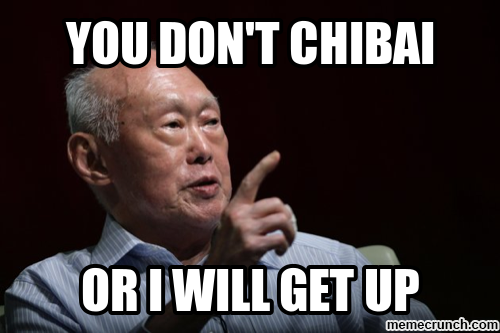 I dedicate this blog post to LKY. UPDATE: Wear black or white? 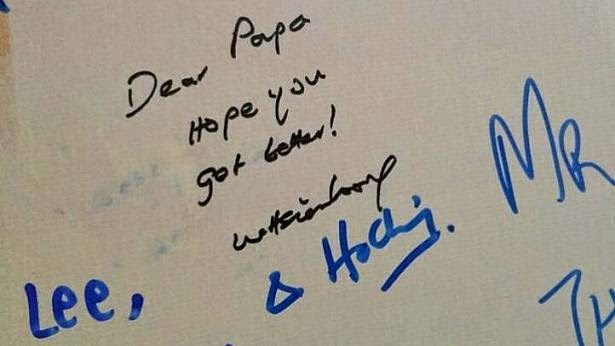 In his message on the passing of Mr Lee Kuan Yew, President Tony Tan said: "Yesterday, we lost the founding father of Singapore." In Prime Minister Lee Hsien Loong's address to the nation, he said: "The first of our founding fathers is no more." 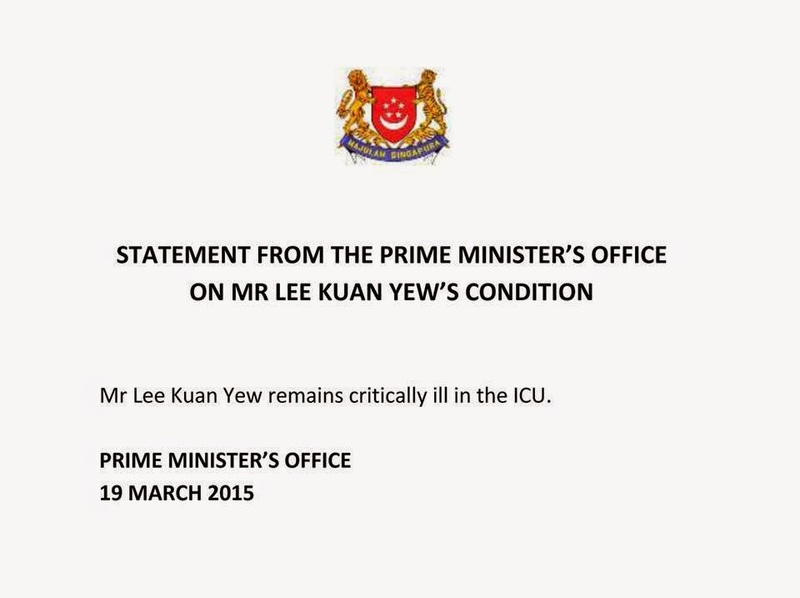 An earlier statement from the Prime Minister's Office said: "The Prime Minister is deeply grieved to announce the passing of Mr Lee Kuan Yew, the founding Prime Minister of Singapore." Although they sound similar, each has a different meaning. The one thing they have in common is the buzzword "founding". Before I go further, I want to make clear that I'm not here to argue about the achievements of LKY (many are already doing that), but to discuss the possible misuse of the word "founding". 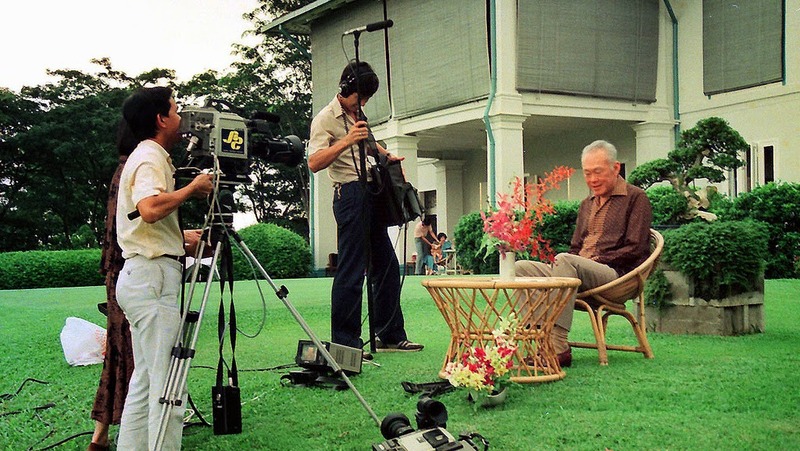 So is LKY really the "founding father" of Singapore? Weren't we taught in school that Singapore was founded by Sir Stamford Raffles and that's why we have a hotel, an MRT station and an institution named after him? 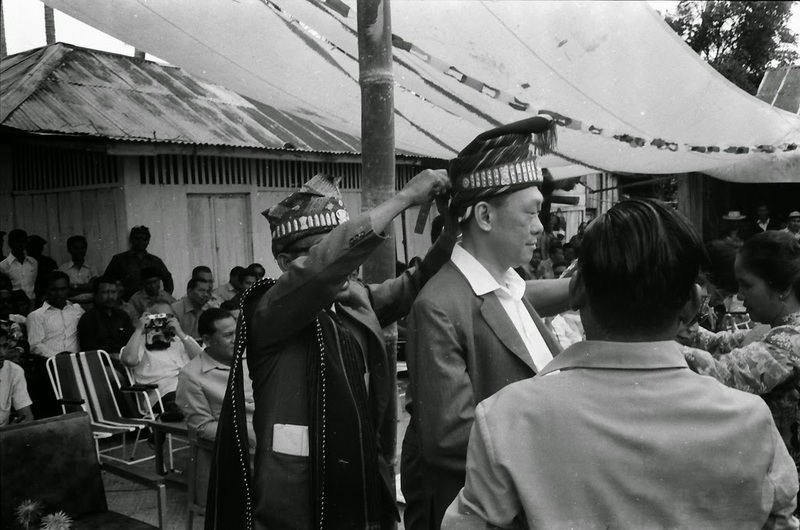 Well, you may argue that LKY is actually the founding father of "modern" Singapore. People just leave out the word "modern" for brevity. 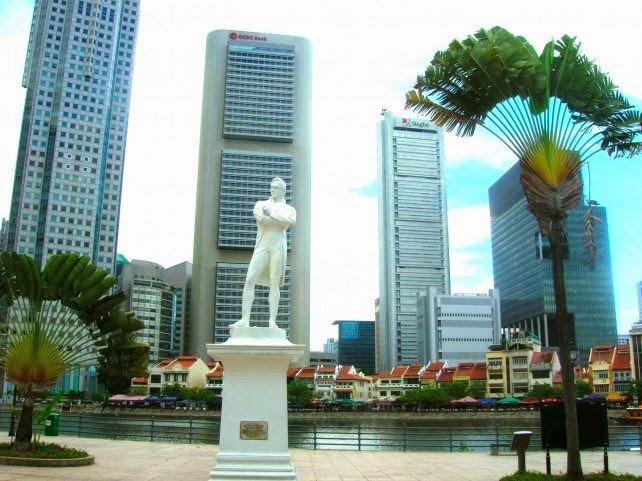 So Raffles was already the founder of "modern Singapore". 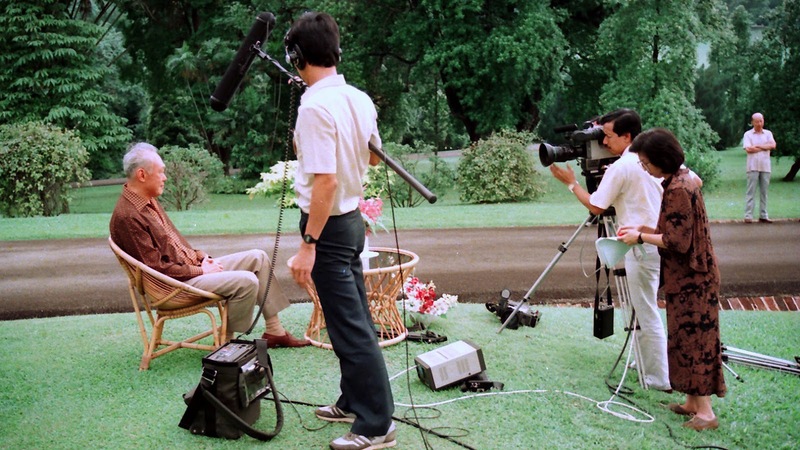 Can there be more than one founder of "modern Singapore" from different eras? 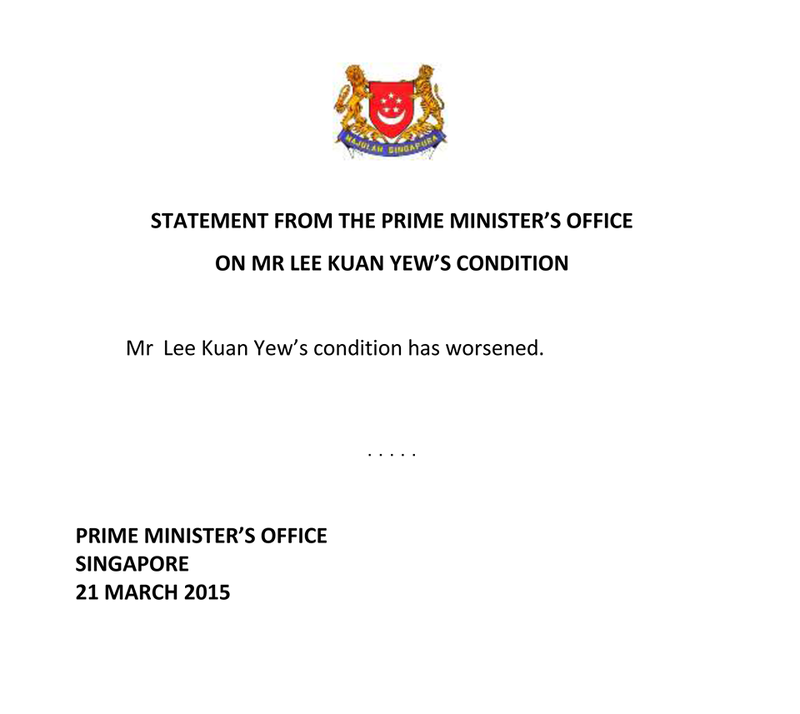 If not, how about we call LKY the "founding Prime Minister of Singapore" then? That just sounds weird. Can't we just call him the "first Prime Minister of Singapore", which is wholly accurate although it probably doesn't have enough gravitas for some people? 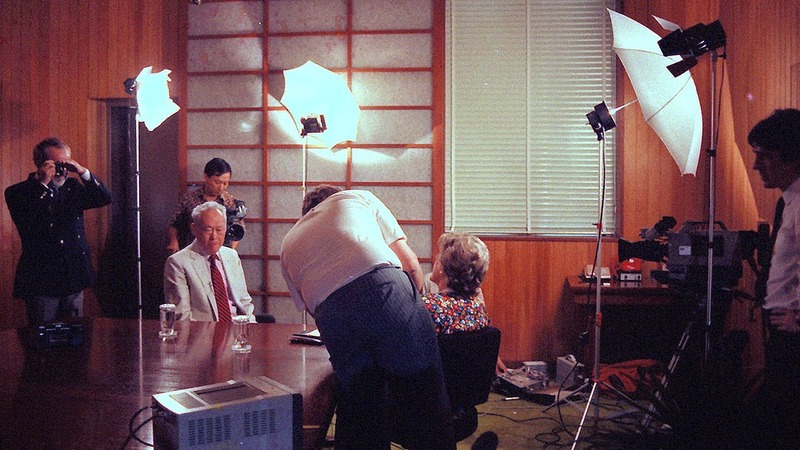 I understand the desire to express the vastness of LKY's contributions to the birth and development of the nation that to describe him as a mere office-holder (even if it's the Prime Minister's Office and he was the first one to hold that office) doesn't do him justice. And so we come up with an awkward term like "founding Prime Minister" or rewrite history by calling LKY the "founding father of Singapore". 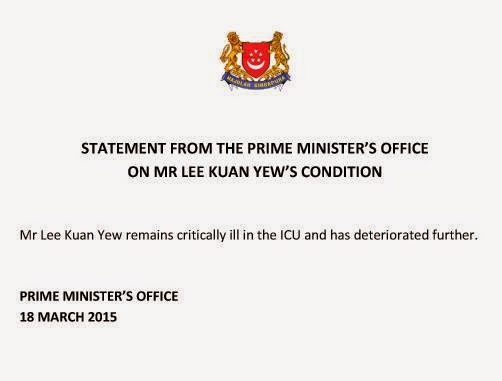 It's as if throwing in the word "founding" would make LKY sound more impressive. That's like bringing water to the Pacific Ocean. 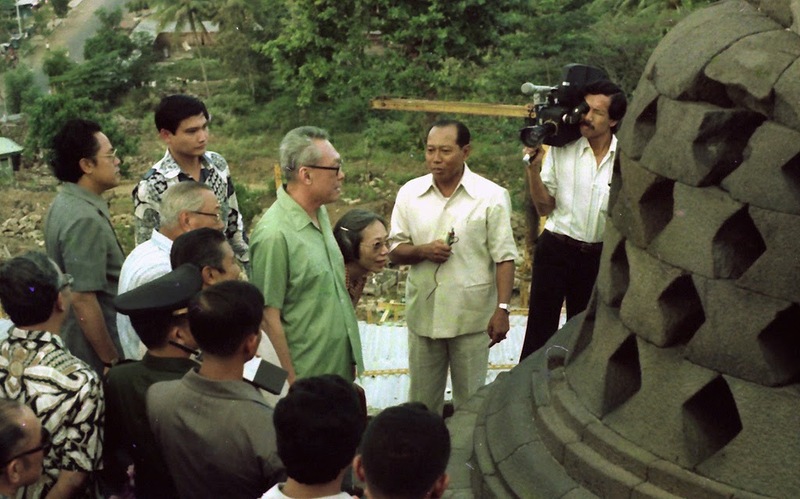 Somewhere Raffles must be feeling indignant: "Hey, I thought I was the founding father of Singapore!"